LED lighting is extremely energy efficient–most of the estimates I’ve seen say that LED bulbs operate at about 1/10 the energy required for incandescent and fluorescent bulbs. That is going to be significantly less drain on your battery. LED bulbs last longer. Without a filament to break or burn out, LED bulbs can last over 100,000 hours. That’s 20 times longer than a traditional incandescent bulb. 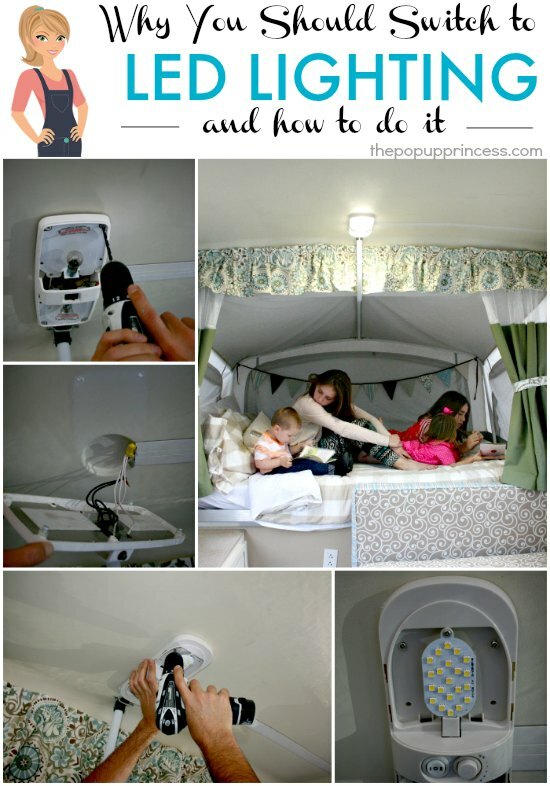 You may never have to change your LED bulbs for the whole life of your camper. LED lighting produces cleaner, brighter, whiter light. LED bulbs come in a variety of whites–from bright to warm, and somewhere in between–so you can be sure you’ll find a hue that fits your tastes. LED bulbs don’t generate the heat that incandescent bulbs do. Those little lights might not seem like much, but have you ever reached to turn off your light in the summer? It gets hot up there! LED bulbs stay cool when lit, and that is a huge plus for me–for both safety reasons and energy efficiency reasons. LED bulbs don’t contain mercury, like fluorescent bulbs do, so they are safer to dispose of. I’m in favor of anything that reduces the amount of toxins we are dumping into our environment. LED bulbs produce almost no UV rays. That means long term use won’t fade your interior like exposure to incandescent lighting will. LED lighting was pretty much a no-brainer for us. We knew we wanted to make the switch, I just wasn’t sure what type of bulbs to go with. I contacted Derek at Coleman Pop Up Parts for advice. I’ve always had good experiences with Coleman Pop Up Parts, and they have a great selection of interior camper lighting. 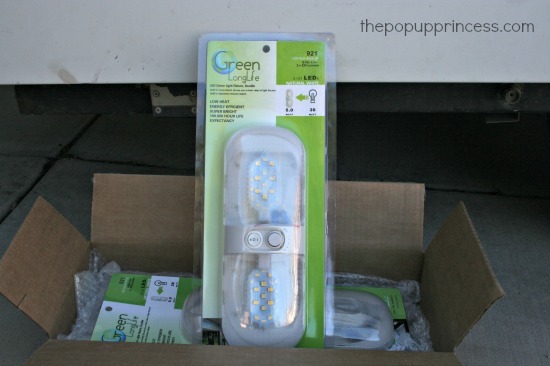 He recommended these new LED lamps (which are also available on Amazon here) and sent me a couple of sample fixtures to review here for my readers. I love that they are a nice, natural white, still bright, but not hospital bright. I also love that they have a 2-way switch, so I can turn on one light or both lights, and they have a dimmer switch. How cool is that? We’ve often had times when one of the family members goes to bed earlier than the rest… yeah, it’s usually me. 😉 When everyone comes into the camper to get ready for bed, they turn on all the lights. I’ve always wished for a dimmer switch or a way to turn down the lights at night. So when I saw this feature, I was sold. I was like a kid on Christmas when my new LED fixtures arrived. They are so pretty! They look much sleeker and modern than my old, outdated incandescent fixtures. Here’s what I had in the pop up before. Yeah… 1999 called. They want their light fixtures back. 😉 And, ew! How dingy looking are those bulbs? The old fixtures were affixed to the ceiling with a type of pop rivet. It took a couple of tries, but we realized that a sharp 3/16″ drill bit was the perfect tool to drill out the rivets. Once we drilled out all the rivets, we removed the wiring connections and caulked the old rivet holes. Caulking the old rivet holes may not be necessary, but we didn’t want to take any chances with moisture getting in the ceiling. Better safe than sorry. The new fixtures are affixed to the ceiling with screws, so we lined them up and marked where we would be drilling holes for those screws. Once you’ve got your screws marked, you can drill a few pilot holes. Now we’re ready to wire up our light fixtures. It is a really simple process. It doesn’t matter which wires you connect where. Just make sure that you’ve connected each wire from the ceiling to one on the light fixture. Here’s a picture of the wiring on the old lighting and the new, just so you can see what I am talking about. There is no black wire on the new lamp, so it doesn’t really matter which wire you connect it to, just connect both wires to the new lamp, and you’re ready to attach it to the ceiling. 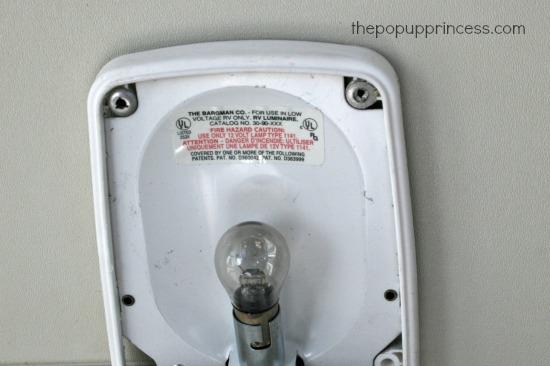 Line up your new lamp, making sure your pilot holes line up with the screw holes in the fixture. Then just screw the fixture in place. Don’t they look so much better than the old fixtures? I’m pretty happy with the color of the light, too. It feels more like daylight and less yellow. Even the kids loved the new lights. 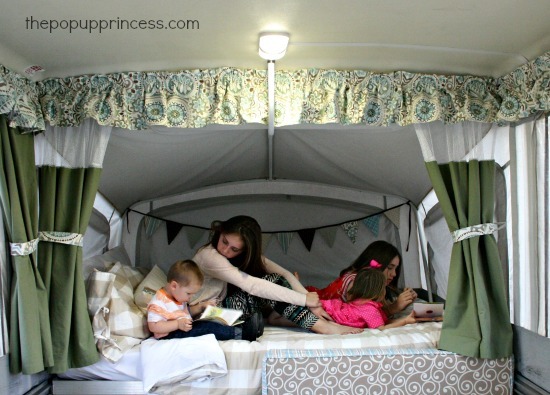 Of course, any excuse to play in the camper is good with them, but they loved the brightness of the new lamps. Daughter #2 even commented how much better it was for reading. Have you considered switching to LED lighting in your PUP? Maybe you’ve already done this modification yourself. Feel free to leave us suggestions and comments below. Thanks so much for stopping by, and I hope this little tutorial was helpful. If you have any other questions about LED lighting (or anything else pop up related), drop me an e-mail. I love hearing from you guys! Thanks for the info! We will def be replacing our lights with these as soon as the weather breaks! Thanks again!!! I love this idea! This lighting looks so much more bright and I love the fact that the bulbs can go for 100,000 hours. Better for the environment! Love the brightness and the low energy usage! I will definitely be switching to LEDs on our new to us PUP! Thanks! I was planning to replace our light with LEDS in the spring, it would be pretty sweet to win one! Thank you for all your ideas – you are definitely inspiring me for our 2000 Coleman Sedona (looks a lot like yours). Anything that helps battery life sounds great to me (not to mention the environment). We live in Colorado and need to use our heater, so don’t want to run the battery down with lights! Thanks for the great information and links! After you switched to the LED, did you see an increase in bugs inside the camper due to the increased brightness? did you consider any other colors? This post was very timely! We’re planning on switching to LED this season and I was looking for the best way to go about it. Thanks for the info! I am loving your blog! You have done some amazing makeovers! Great inspiration for me! i love that they preserve battery life and that they are better for the environment. We do a lot of back-country camping and rely on our batteries. They look so fresh and clean compared to my originals! I’d love to replace mine! I like the idea that these are 230 lumens. PLENTY of light! LOVE THE LOW ENERGY USAGE OF LED LIGHTS! Love the energy-efficiency for our old pop-up! We just switched our bulbs to LED, they were not very bright. This is an option for us to try. We just bought the camper a few weeks ago and are trying to fix a few things before we take it out. I am not a seamstress, but I do want to tackle new covers for the dinette seats. Hmmm….. Now I have to choose… Work on camper or continue to catch up on scrapbooking! Thanks for your blog, found it on pintrest, look forward to learning much from you! The lights look great, I like that they are so bright and clean. Thanks for this! Love the bright light and long life of the LEDs. Loving these lights! We are planning on buying a new to us popup as soon as we find one that meets our needs and the energy saving as well as the dimmable feature makes this a no brainer! Husband is an electrician as well and he loves a good light! Love the efficiency as well as that it comes with two! And they are dimmable!!! Would really love to change our lights to LEDs — in our ’91 Coleman. I love checking in on your blog to see the new updates for your pup. I would love to replace the lighting in my popup!! Great ideas. Love to read what you are up to next! Perfect timing!! We were just discussing replacing the bulbs with something more efficient but I like your new ones much better! Can’t wait to show my husband these lights! This a a very useful site and it would be great to win the light. We like the idea of using less energy. I love love your site!! 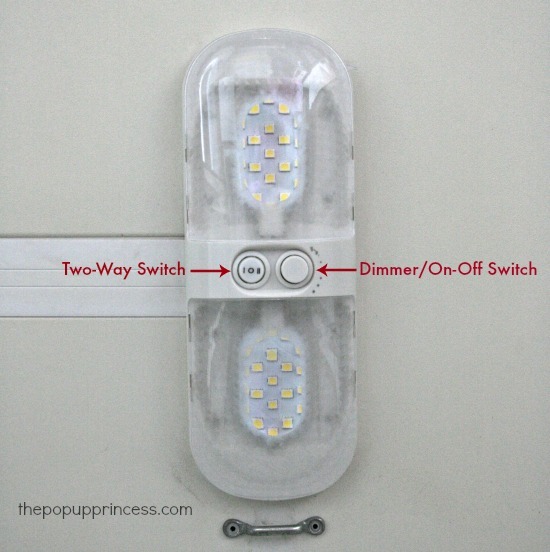 It would be wonderful to win the energy saving light, and the dimmer switch is a great idea. My fingers are crossed . I want to win!!! I love how bright they are! Anything to let more natural light into our hybrid camper is a plus! We got our new to us pop up in December and just love it! We want to change out all the lights to LED so we’d definitely love to win this! And we’re all about party lights for the campsite…Coleman Pop Up Parts has some good ones! I like the long life and clean look of these lights. Can’t wait to try tonchange mine out! We’ve switched out our bulbs for LED before, haven’t yet in camper we have now. I like the look of the fixture but don’t see the ‘stereo plug’ for the additional lighting which is one of the thing we use. 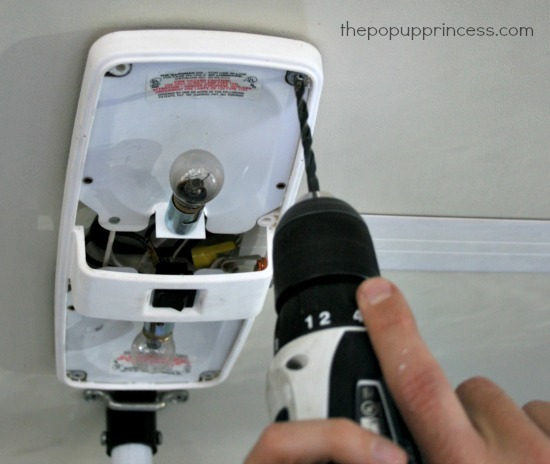 While the new fixtures don’t have the 1/4″ plug, you can still add it easily enough. I removed the connector from the old fixture, drilled a new hole in the new fixture (on the same side as the 2-way switch) and connected it in with the rest of the wiring. I’ve got the best of both worlds. Love the flexibility of dimming and keeping the bunk end options available. Looks like it came that way. Next project is to take one of the single dimmable LED fixtures and convert it to a bunk end application. Love the LEDs! We are picking up our (new-to-us) Coleman pop-up TOMORROW! I can’t wait to start the remodel. Dimmable lights in the trailer?! That is life changing! We just got a 1999 Coleman a few weeks ago and have been inspired by your blog! These lights would be a great first renovation..especially would like the dimmer feature! My husband and I have been looking for new lighting for our Starcraft popup. We are redoing the entire roof. Before we owned it, the roof must have had some major leaks. We went to replace the fan and saw all the wood in the entire roof was molded. We are in the process of making whole new roof. 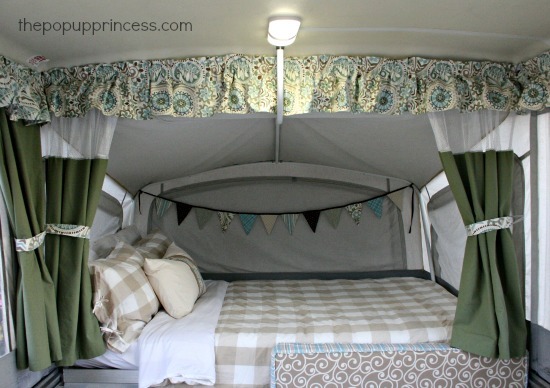 Love the dimming feature….this is first on my list for our popup! Wow. I didn’t know there was a dimmer LED fixture. I just got the LED strip lights with remote that dims the lights but I like the fixtures better. Maybe I will use the strip lights for under the awning and but some of these dimmer fixtures. Thanks for posting. We used them for the first time on a camping trip this weekend, Stella, and I really love the dimmer feature. It was so great to be able to turn the lights down when half the family was awake and the other asleep. So glad we made the switch! We just bought a 2000 Coleman Santa Fe this weekend. It thankfully is in very good shape however always a couple things that need done, right? 🙂 Ordered a set of the LED lights yesterday and looking forward to getting them installed. I just bought my first pop up trailer so I am not a seasoned camper, so this is probably a stupid question but what do you mean about your battery dying? Every campground I have ever been to has an outlet you plug into, just like plugging something in at home? Are you doing more off the grid type camping? That does sound fun! Maybe we will try that next year. This year I think we will stick to campgrounds, which is super lame haha but since we are new to this it is probably better this way! Nice job! How long are the screws used to attach to the roof? And do you know the thickness of the roof? I want to install some mods to the roof, but don’t want to drill too far or use a screw thats too long. The screws came with the light kit, Ryan, so I’m not really sure. We are thinking they were somewhere between 1/2″ and 3/4″. Sorry, I can’t be much help here. What are you thinking of installing? Sorry for the late reply. I was “off the grid” for a little. I want to install shelving (similar to yours) but secure the top to the roof by mounting some “snap-in” hardware. Cool, Ryan! I’d love to see pictures! Nice upgrade! People who don’t want to fool with reinstalling new fixtures should note, of course, that LED replacement bulbs are now readily available for the existing fixtures. I swapped all mine out last summer in the original fixtures and they work great; brighter than the incandescents, no messing around with a drill. Why waste a perfectly good light fixture? Dimming feature would be nice, I admit, but this seems a lot easier. Do the new ones have a port to plug in the extra reading light? 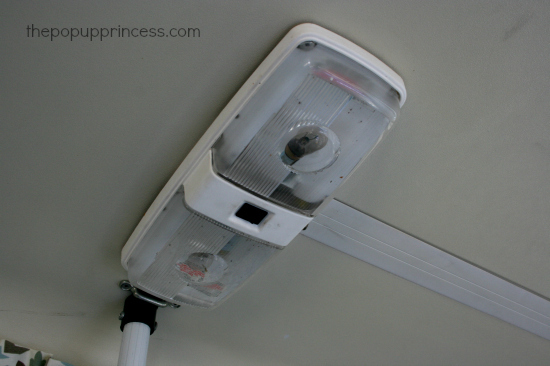 In our Viking camper the lights clip on to the support poles and have an outlet to attach a ceiling fan. I’m not sure I can find those in a LED so I may just have to change out the bulbs. If anyone find the ones with the port please post it and I will also. Thanks for all the great ideas! We are also changing out the running lights to LED so that I don’t have to keep changing the darn bulbs. very cheap and straight swop. Great site. I am from the UK but have a coleman pup (US version) my wife and i love it but getting spares is not easy over here. So sites like this are so helpful for us keep up the great work. Hi, quick question on the lights you put in. After reading reviews on amazon, it seems a lot of people have had issues with the switches on these particular lights. Mostly being that the dimmer knob is not easy to use as the way to turn them on and off. Just wondered if you’ve had these same opinions after having your lights up for a year or so. Thanks!! Hi Larissa! I just bough my PUP 2 mo ago and the first thing I did was switch out all the lights to LED bulbs. However, I didn’t change the entire light fixture? Is there an economical way for doing it or did you just want new fixtures :))? I would guess that using just the LED bulbs instead of a fixture would still result in low energy usage, but I am not sure. Any opinion on that? Thanks in advance! 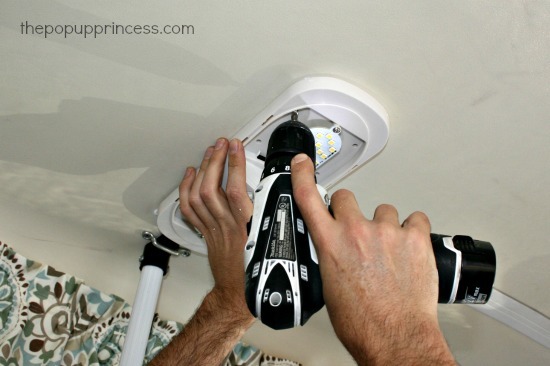 Have you ever considered adding an extra interior light? My interior lights are centered just outside of each bunk-end, so my kitchen and countertop prep areas are extremely dark. Just wondering if you have considered this modification or heard of anyone doing it? Hailey, I just did add two LED lights (single bulb type) over the sink/stove area and over the dining table. I was installing a Fantastic Fan at the time and was able to run power from a slimline junction box I mounted between the existing light and the fan. I was able to use that thin, plastic wire mould that adheres with an adhesive strip on the back side (from the local hardware store). Easy, peasy! I used 16 gauge wire and proper crimp connectors…didn’t want wire nuts to loosen with all the vibrations the trailer is subjected to. When I drilled the holes to mount either the lights or the junction box I would take those plastic wall anchors like you use in your house to put screws into the wall board, soak them in water (OK, just get them wet), and apply a dab of Gorilla Glue…pop into the hole all the way and wait about two hours to set. Then mount the lights with a number 8 stainless crew about 5/8″ – 3/4″ long. Sure does brighten up dark areas especially at the sink/store at night…gets rid of the shadows when you are standing there. We’ve got plans to replace the two mounted interior lights to LED, and we were wondering if there’s any way to switch the utility light from incandescant to LED as well. Great write-up! Can you talk to how these have held up over the last couple of years? When updating car lighting with LED, for instance, I’ve heard of a lot of issues with the LED bulbs failing, flickering, etc. I’m just curious to get your feedback on long-term impressions for the fixture you used. I just replaced the incandescent lights in our ’97 Coleman Sunridge with LED lights similar to yours. Mine were “polarized” where the black wire needed to go to the black wire and white to white. 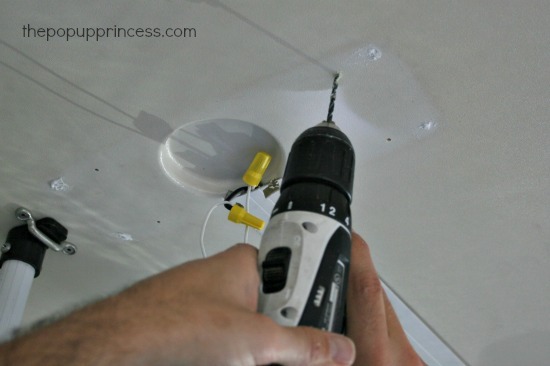 One thing that I did was after drilling a 3/16″ hole for the screws I used plastic anchors into the ceiling. 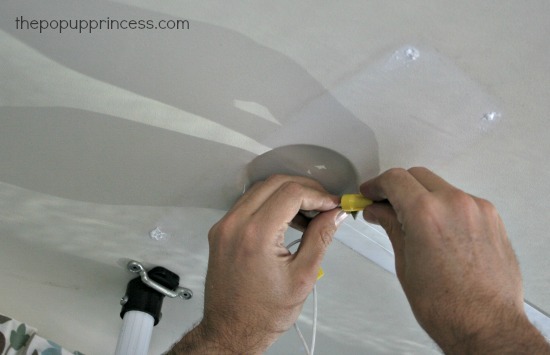 I first soaked the anchors in water and then applied a light dab of Gorilla Glue before inserting into the ceiling. Once the glue had set (a couple of hours) I was able to screw the lights into the anchors. I just didn’t trust the screws into the thin ABS on the ceiling with all the bouncing and shaking and vibrating that the rig would endure traveling down the road. This is the same process I used installing the Fantastic Fan on top of the roof and when I replaced the canopy moulding after reworking the outside of the top (using your techniques). Our “porch” light is broken and I ordered a replacement. I wish I had seen this post first. I would have ordered an LED replacement! Installed mine today – two ‘singles’ – #3490101 from Beckley’s RV (Coleman Pop Up Parts) and they are a nice upgrade. My 2011 Coleman Sedona had four sheet metal screws (not rivets) securing the original lamps, and two of the four mount points aligned with each of the new fixtures. Popped two fresh holes with a 1/16″ bit for the others, and all assembled easily, using the original screws. Our camper has two lights on each end of the camper, it also has a jack for a small fan that cools the end bonks. Does the new fixture have jacks for the end bunk fans? 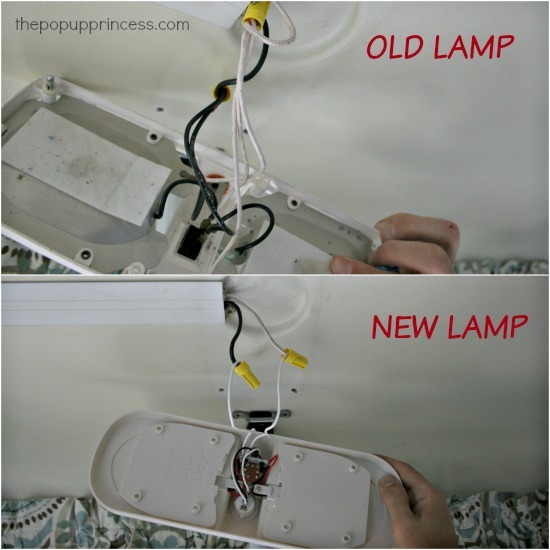 Can’t you simply change the bulbs to LED bulbs instead of replacing the whole fixture? I was wondering if it is possible to just change the light bulbs to LED instead of changing the whole fixture?